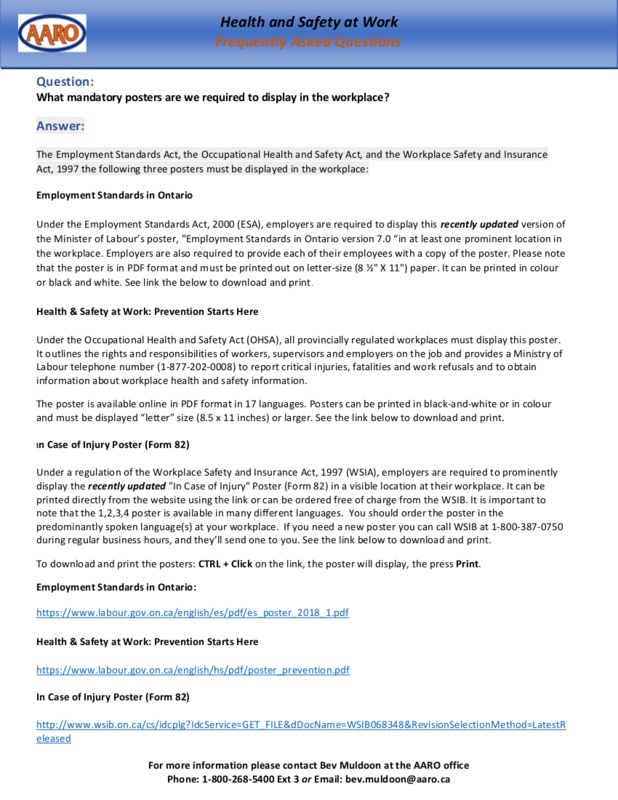 To find out more or to sign-up for the Health and Safety Compliance Training, contact the AARO office 1-800-268-5400 (toll free) or send us a message using the form below. Accessibility in the Workplace Level 1 – Customer Service Standard – Accessibility for Ontarians with Disabilities Act was passed to create an accessible province by the year 2025. This course is the first standard. Accessibility in the Workplace Level 2 – Integrated Standards – The AODA Integrated Standards course reviews regulations contained in the newly-released AODA Integrated Standards. Prevention of Violence and Harassment in the Workplace – This course provides training on the policies and procedures of Bill 168 are designed to reduce workplace violence and harassment. Prevention of Violence and Harassment for Supervisors – Designed for Ontario supervisors/managers, this course covers general information such as the law, prevention measures, and how to recognize & respond to violence & harassment in the workplace. Slips 100 – Slips, Trips and Falls – This course covers preventing slips, trips and falling accidents in the workplace. Setting up a Health & Safety system in your Small Business: A guide designed to assist you in developing a health and safety system that meets your business needs and reflects the care and support you are committed to providing to your workers!